Firing a gas kiln is an experience of prolonged, but intermittent attention. You need to be there at certain critical moments: starting it, of course, throwing it into body reduction and out again, spot checks of the cones, the pyrometer, the atmosphere every hour or so. There's a long gap in mid-afternoon between cone 4 and 8, after which it's time to pay attention again, particularly if the top and bottom temperatures are uneven. And then the (subjective) eternity between cone 9 and 10, when it's time to shut down the burners, close the damper and ports, and go home for a much needed rest. Different potters deal with the intermittent part differently. Jon throws dozens of pots, moving them in and out of the kiln room to take advantage of the heat to speed drying. Sookjae and Michiyo share their firing, so they get to take turns leaving or staying, mostly reading while here. Tea is notorious for going to the movies during the long afternoon stretch. 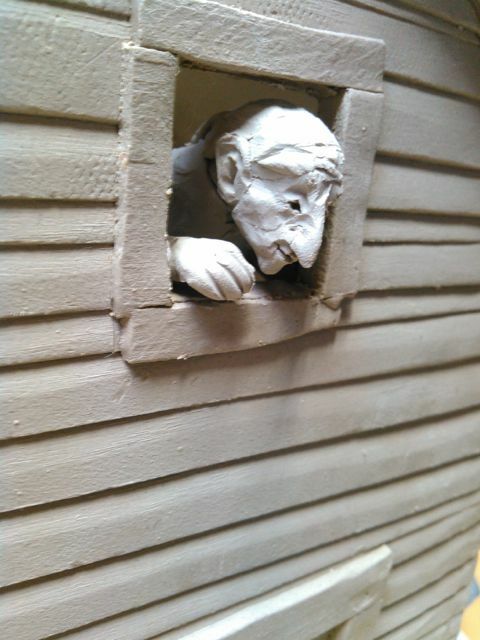 I fidget too much to throw, or even sculpt down here, I'm always getting up to check the cones. I also don't like to actually leave the studio for more than an hour or so at a time, so a double-feature is out. I can only read for so long, do so many sudoku or cryptoquotes, or blog posts before I get bored. So I've rewired potter's wheels. Installed new shop lights. Fiddled with the pyrometer and thermocouple, got them working properly again. Today, I fixed the ware cart. It's a very basic design, probably goes back to the 60's, two 2-by-4 uprights supporting 2-by-2 shelf brackets. Easy to put work on and take it off by the shelf-load. Only problem? The brackets wiggle. They move like a teeter-totter. Put a shelf of work down on one side and the shelf on the other side goes up. You needed to be very conscious of the relative weights when loading it up. So today, I brought in my drill and driver bits, a bunch of self-tap screws, some pre-cut 2-by-2 support blocks. A small level, a bar clamp. In a little over half and hour, the job was done. Shelves are now all firm and level, no give, no bounce. A community of potters is gonna be so grateful. Now what do I do with the rest of my afternoon? Once upon a time, I was a math major. Well, art and math double major, I took the math classes for fun. And one of the things I remember from math is this: conical forms are self-similar. What this means is, if you take a regular cone that's, say, six inches high, and slice off the base an inch from and parallel to the bottom, the second, truncated cone is proportional to the original. Or, to reverse the process, if you continue a cone several inches, following the same angle, the new, bigger cone is also proportional. 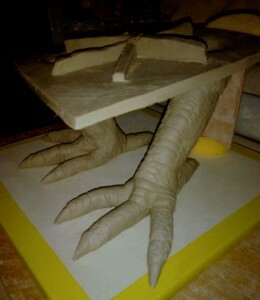 This is the surviving, base section of my quail sculpture. You'll note the top of the piece. It's conical. Well, conoidal, actually, a teardrop in cross-section. 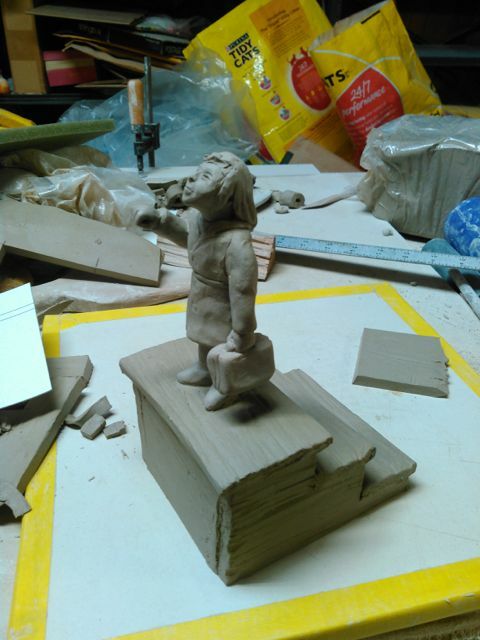 but the angle is consistent, so if I could extend it by the correct amount--about a quarter inch, by my calculations--I should have a base proportional to the original, wet-clay version of this one. That I can build a complete replacement quail body on. I'm thinking thin, flexible cardboard; Denise always has a stash with her bookbinding supplies. The last time I did this, I was in crisis mode. The clay body I'd relied on for years--Pine Lake White, from Seattle Pottery--had started throwing out chips. This sometimes happens when the fireclay component has insufficiently-screened bits of limestone in it. They calcine down to quicklime in the bisque firing, then rehydrate to lime from atmospheric moisture, expanding just enough to pop a little chip out of the surface. You can tell that's you problem because there'll be a little white bit at the bottom of the hole, lime-pops they're called. This time, there were all the symptoms of lime-pops but the lime. Mystery pits were showing up after bisque, sometimes even during the glaze firing, which is worse. (You can sand/grind down the pits to minimize them in your bisque. If a chip pops out in the glaze firing, it leaves a bare hole and, often as not, a flake of clay stuck to the glaze.) My potter friend Pete Meyer suggested the problem might be bits of lignite (soft coal), which would burn out entirely. Whatever it was, it was driving me nuts. Worse was the supplier's reaction. They claimed no knowledge of the problem; apparently, I was the only potter in the Northwest who had this happening. I decided to take my business elsewhere. After testing a bunch of clay bodies that looked similar (based on sample chips on their website), I settled on Clay Art Center's DWS. I've used DWS for a couple of years now. It throws and hand builds well, iron spots nicely, but it's difficult to trim. 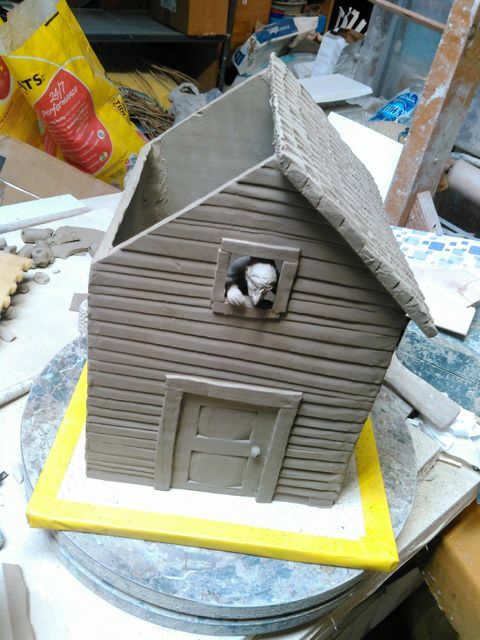 This summer, in particular, I've noticed that it's very hard to smooth out the pits left behind by the coarser particles, and that can sometimes lead to pin-holing in the glaze. I don't know if the particles are coarser, or I'm trimming differently--dryer, perhaps, since it's summer, or my recently re-sharpened tungsten carbide trim tool has different cutting characteristics. In any case, it's wasting my time and occasionally, my pots. So I'm testing again. Two candidates this time: Dakota White, which is basically the same clay without the coarse bits (DWS is apparently short for Dakota With Sand), and CAC White, recommended by the salesman in Tacoma, which I suspect will be too white for my glaze palette. I want a warm tone with iron speckles in my glaze, and I don't think I'll get them. So far, I've done shrinkage tests, flat tiles scribed with a 10 cm line that I'll then measure as they dry, are bisque fired, and glaze fired. I've also thrown and trimmed some bowls--both trim nicely smooth. I'll also need to do some tests throwing larger forms, to see whether I really need the sand or not. I could theoretically buy both Dakota and DWS, but I hate to complicate my life like that. One clay body, please. Most potters in the world (Japan excepted. Don't ask me why.) throw with the potter's wheel turning clockwise. But I'm left-handed. I grew up in a world of Of course, that's if you're right-handed. Left-handers reverse these directions. So when I first started to throw, I kicked the wheel clockwise. If the regular pottery professor had been teaching, or if Viterbo had had electric wheels, it might have been otherwise. Throwing is very ambidextrous, equally easy (or difficult. For me, more the latter) to learn turning either direction, and back then, few electric wheels had a reversing switch. But Tim was on sabbatical, Jan was occupied with teaching an unfamiliar class, and the studio was committed to Leach-style treadle wheels, so by the time anyone noticed, I'd gotten used to the direction I was throwing. I continued throwing on kick-wheels, left-handed, after college, all through graduate school, and into my days at the Craft Center. I did teach myself to throw counter-clockwise as a teaching assistant in grad school, the better to do demos, but it never came as easily as clockwise. Fast forward to my days with Slippery Bank Pottery. I was committed to making nine dozen hummingbird feeders as week, while continuing my teaching load. Kick-wheels weren't gonna make it. I mentioned Japan earlier? For some cultural reason, right-handed potters throw clockwise there. Fortunately for me, the Craft Center had a Japanese-made electric wheel, an old Shimpo that nobody used much because the speed control was either a very stiff, inconveniently placed pedal, or the attached gearshift-style lever. It quickly became my wheel. Wheels with reversing switches are more-or-less standard these days, so I guess I'm not the only lefty out there. I have two electric wheels now, a Pacifica with factory reverse and an old Soldner with a switch bodged in by the previous owner (who I once made hummingbird feeders for). But I still get the occasional confused look as I throw, from spectators who aren't quite sure what's different, but know something ain't right. Reluctantly started glazing for my next firing yesterday. I've gotten spoiled by my unplanned week off, want to play in the studio or lie around reading. Unfortunately, deadlines wait for no one. The back room is still full of Sookjae's pots until this morning, so I do the easy stuff--elephant banks, one dip in clear glaze--and fussy stuff--dragons, multiple layers, lots of wax resist. Afterwards, I wax a bunch of teapots and casseroles for the morning, and look for other work to do. The chimney looks a little loose, gaps between the bricks. During a firing, the bricks get hot enough to actually expand a few millimeters, push each other apart. As they cool, they don't move back, so each firing finds them a little further apart. Gaps between the bricks allow air to be pulled into the chimney, diluting the pressure drawing gasses from the kiln itself. Less draft means a less efficient, less controllable firing. More reduction when I don't want it, more fuel burned, more time wasted. The solution? As the Hitchhiker's Guide once said, the secret is to bang the rocks together. Or in this case, bricks. All you need is a hammer and a scrap of 2x4--and a dust mask--to bang in from the corners. Back to back, side to side. 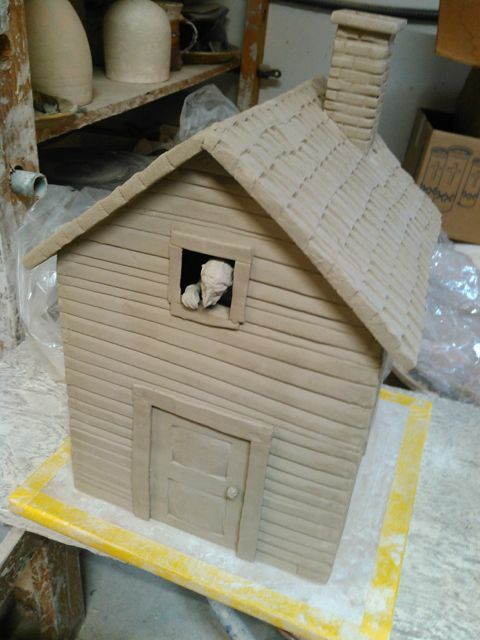 Can't push back from the front, sadly, chimney's too close to the kiln wall, but I can still make the kiln visibly tighter by the time I'm through. 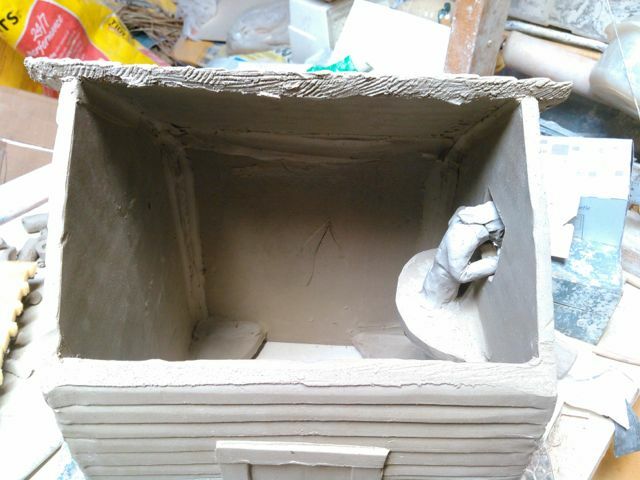 In my normal firing schedule, we load the kiln during the day, go home and collapse, then I rouse myself to come back and light the kiln at 8:30 pm. With the right adjustment of gas, it'll fire on its own until I return around six the next morning. 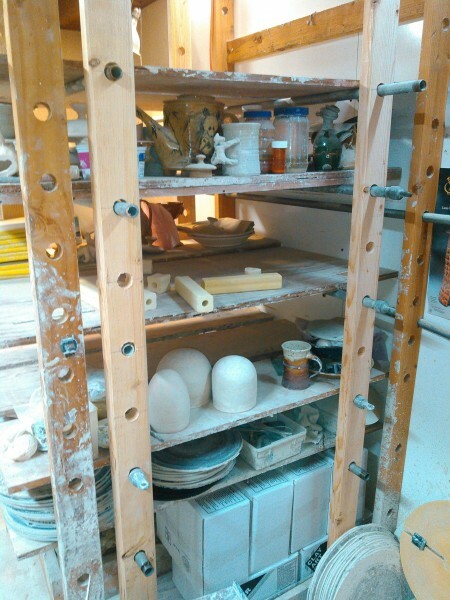 With luck, I'll find the kiln orange hot and nearly ready for body reduction. This firing was different. We had tickets to see Alton Brown at the Hult Center last night (if you were there, I was the one who shouted Temperature control! during the mixed drink bit), so had the choice of starting the kiln early, before the the show, or waiting until after. I didn't want to fire super slow and waste fuel, so opted for the latter. Finally got things started at 11 pm, did my best to gauge flame speed to give me enough heat, but not too much. And of course slept terribly all night, worrying that I'd got it wrong. Arrived at 5:54 am to find orange heat, cone 08 down on top but not bottom, so went straight into body reduction. Thirty minutes later, 08 has dropped on the bottom, 04 top, and I'm well into the firing, still dark outside.